Constable Martin Windt was shot and killed while attempting to arrest a man for disorderly conduct in West Homestead. The subject had been involved in an argument with his parents and was speaking with his friends when Constable Windt located him and asked to speak with him. The subject took a few steps back, drew his weapon, and fire several shots. Constable Windt was struck in the head and abdomen. He was taken to Homestead Hospital where he succumbed to his wounds shortly after midnight. The man fled to a girlfriend's home where he shot and killed her mother and a neighbor after forcing her to kiss him. He then fled into the nearby woods pursued by a posse. He was able to escape the posse and remained at large until 1920 when he was arrested in Youngstown, Ohio. 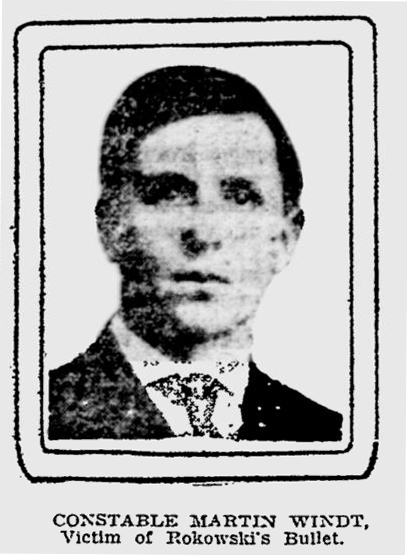 Constable Windt also served as a detective with the Pennsylvania Railroad Police Department. He was survived by his wife. Rest In Peace Constable Windt. Your service and sacrifice is remembered.